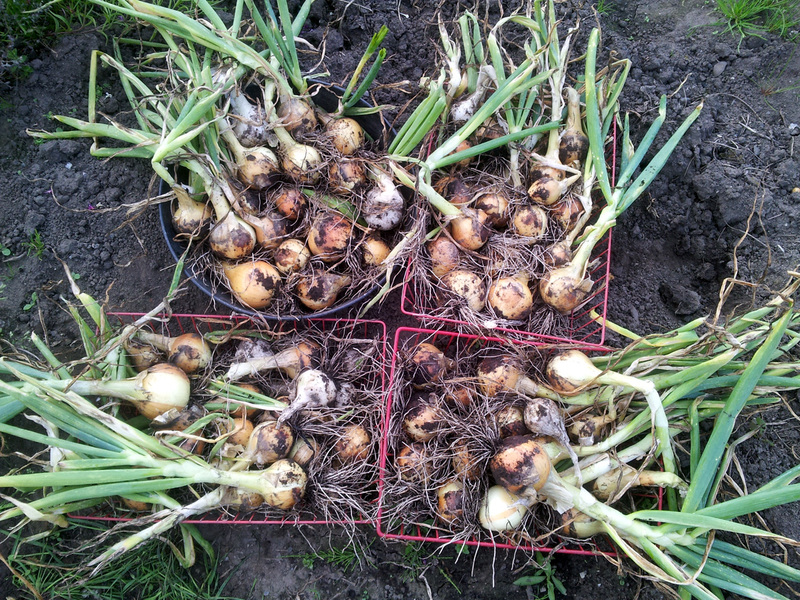 When the temperature drops and the foliage dies, it’s time to check for Yacón tubers. 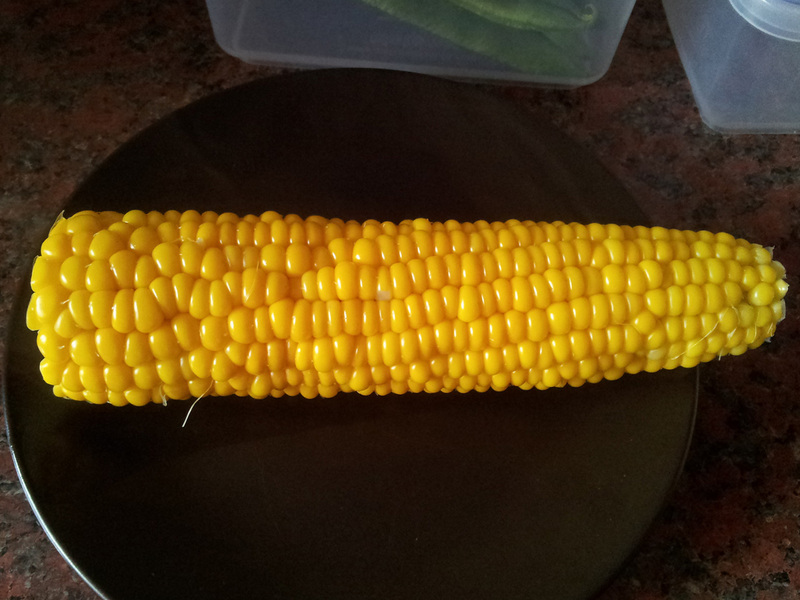 That’s not a bad yield at all for a single plant and a first attempt. 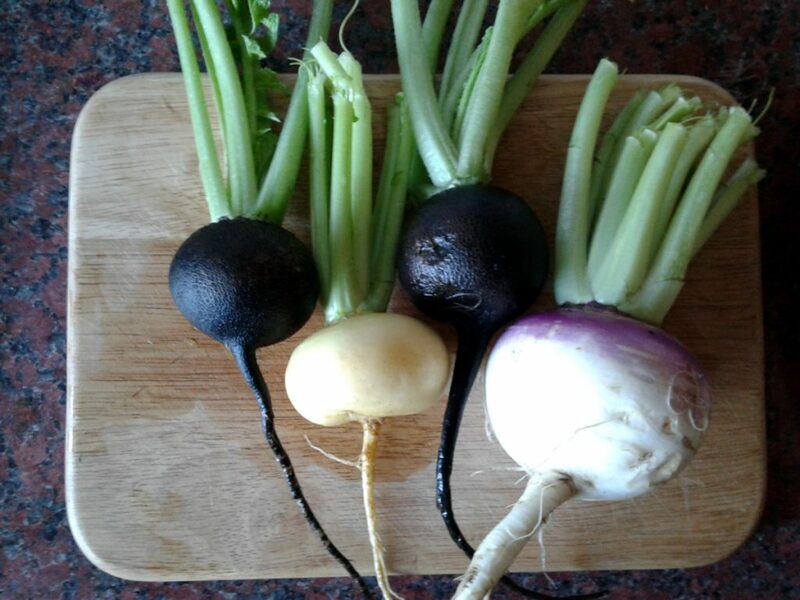 A few years ago, veg pioneer Mark Diacono wrote a piece on growing, harvesting and cooking Yacón for The Guardian, which explains what happens next. 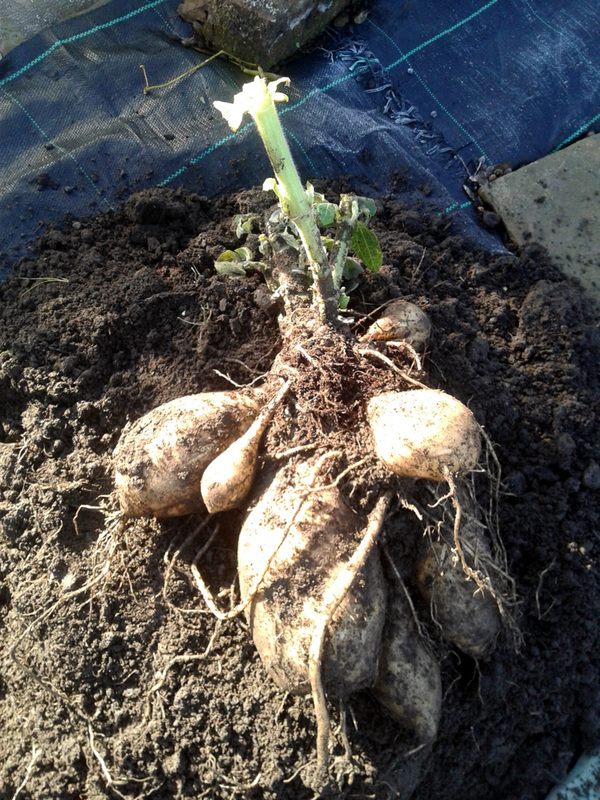 The larger, ‘storage’ tubers are detached from the plant and left for a couple of weeks to sweeten. 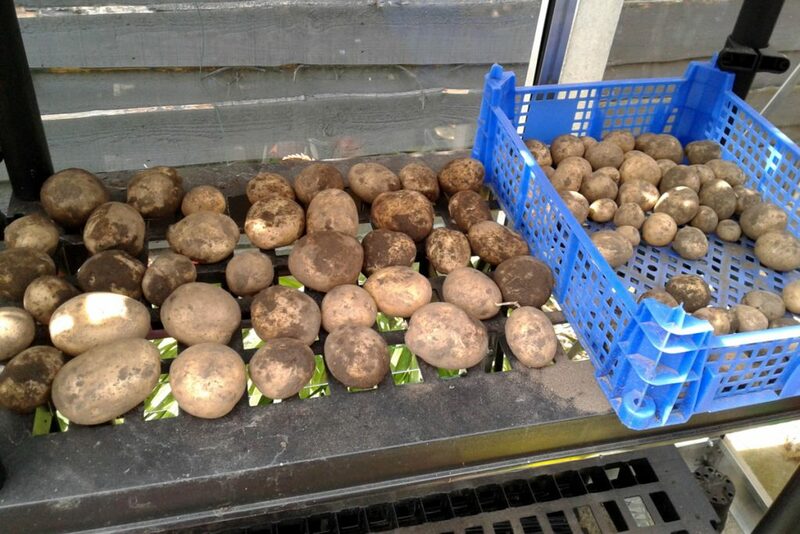 The smaller, Jerusalem artichoke-like ‘growth’ tubers are the essential part of the crown that needs to be packed in moist, spent compost and stored in a cool, dark place over the winter. It’s the same sort of procedure as you might use to store a Dahlia crown. 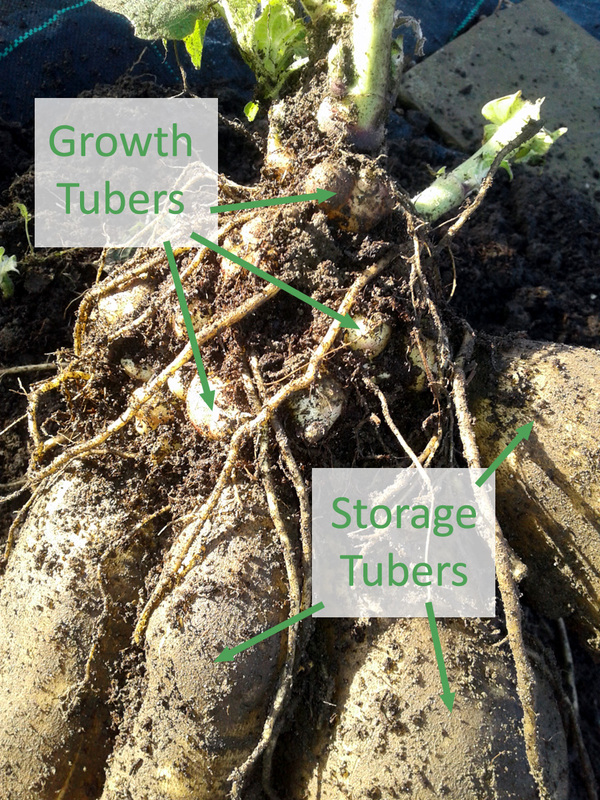 The Yacon develops two kinds of tubers; edible ‘storage’ and next year’s ‘growth’ tubers. 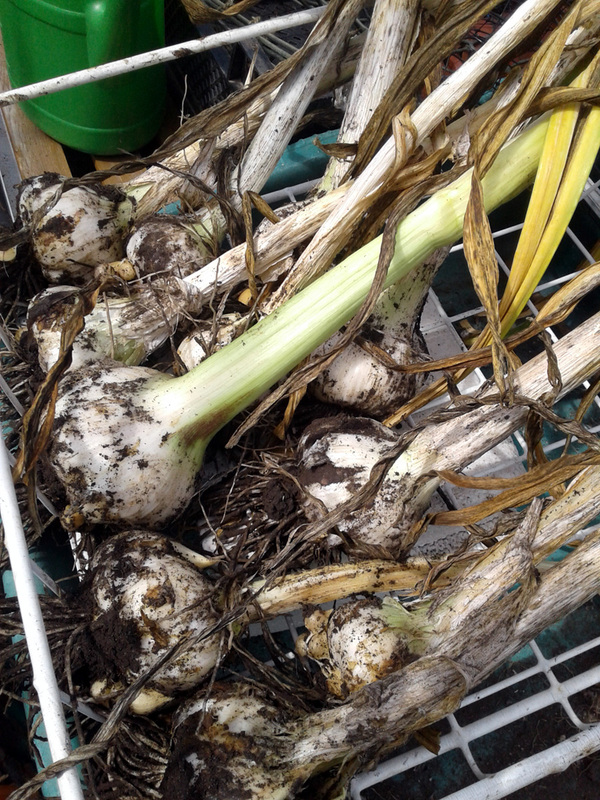 With the large tubers detached and sweetening, and the crown carefully packed away for winter, the next stage will be to cook ’em, eat ’em and see if Jo and I actually like ’em or not. (I did try a small piece raw on the spot and it was rather like a juicy radish / sweet chestnut, so I’m probably a fan already). Then then there are two more tubs to come. 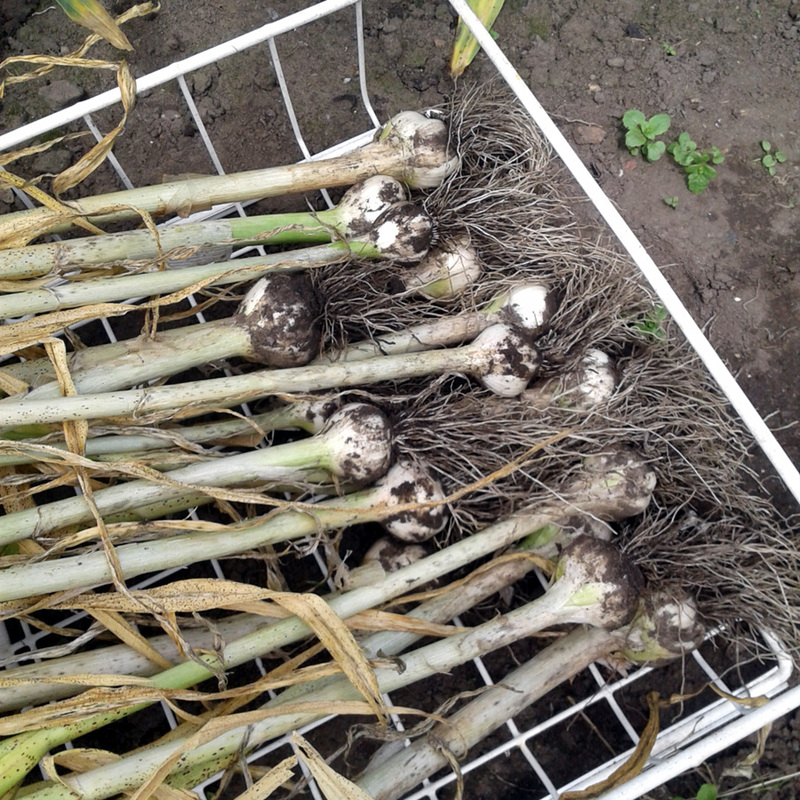 Apparently the large tubers store really well, so either we’ll be eating them for weeks and months to come, or my colleagues on the Ordsall Hall gardening team will be getting a few more Yacón tubers to try than they’ve been led to expect. How about you? Have you grown Yacón before? Do you have any top tips for storing crowns or cooking the tubers? Please do let me know, via the comments. 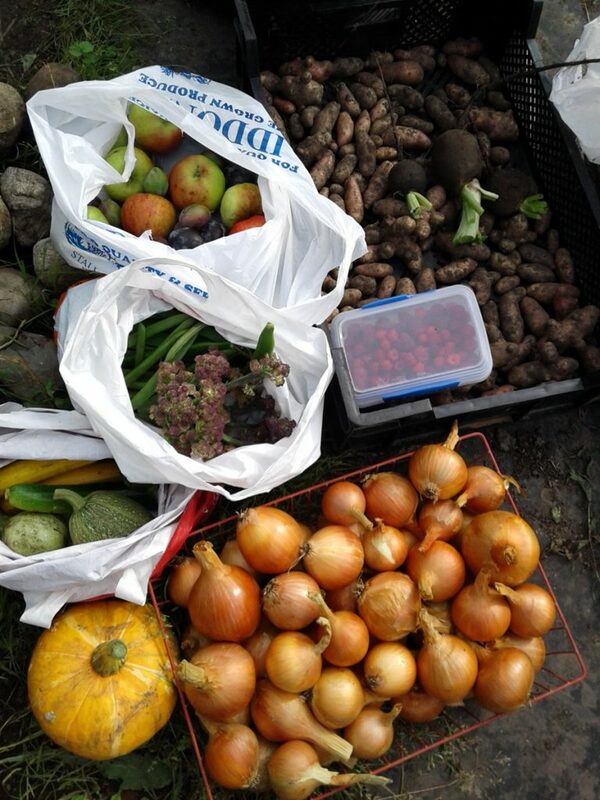 Autumn is in full swing down on Plot #59 and we’ve got the seasonal veggies to prove it. We also called time on our single, lonely tromboncino squash. Not worth entering in the Sutton’s Cup, but definitely tasty – we oven-roasted chunks of it to accompany our Saturday sausages and it was pleasantly firm in texture with a lovely, nutty squash flavour. 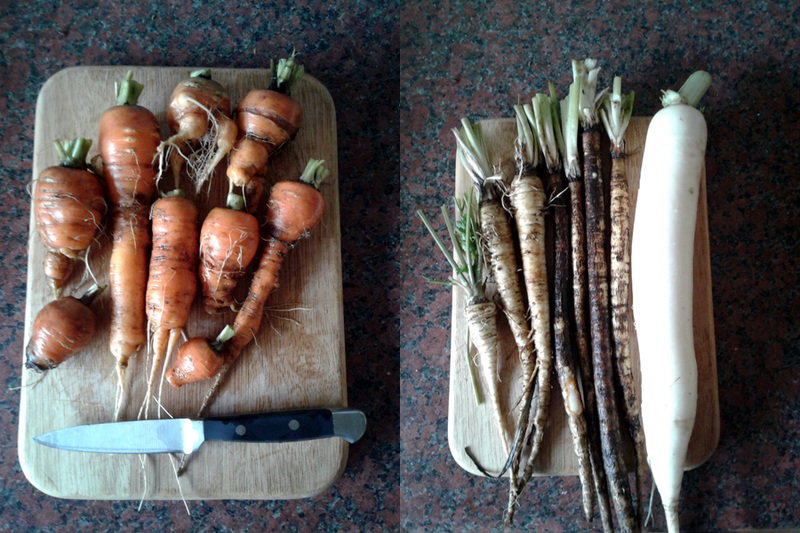 Also on that plate were the first pulled roots of the year: a few trimmed-back but mostly manky carrots (not a good crop after all, by the looks of things), and some much nicer salsify, scorzonera and mooli (although at the risk of seeming indelicate, one of those last three gave me terrible wind yesterday… just a word to the wise, there). We’ve started to pick out first kale leaves and cabbages. 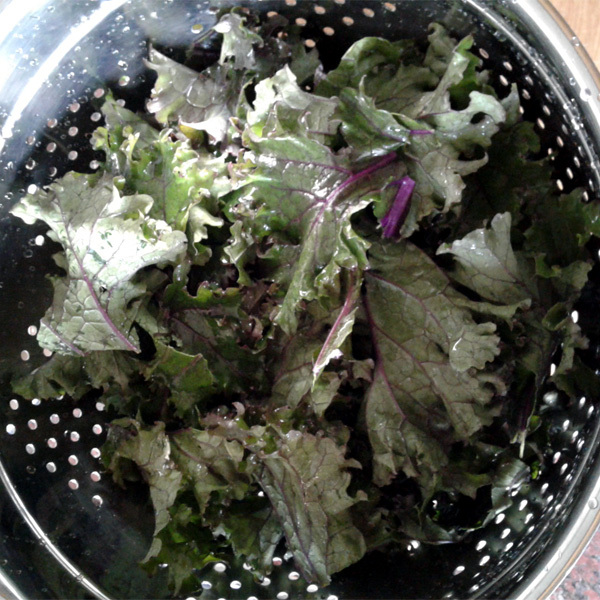 They went in late and the slugs have had a field-day on the latter, so there’s a fair bit of livestock to remove before the cabbages can be cooked, but they’re very tasty once you get them properly cleaned up. 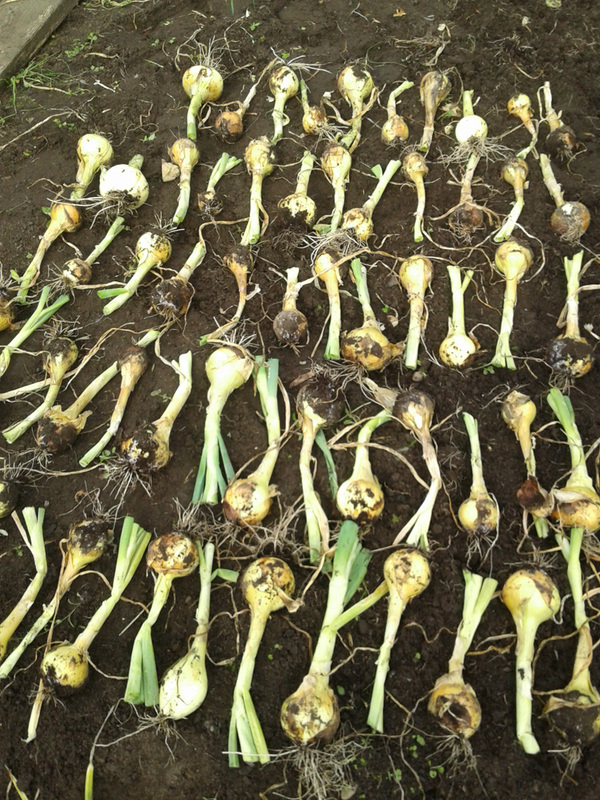 This lot is destined for a date with a hot frying pan and a big knob of butter. A few artistically arranged chilli fruits; many more went into a batch of chilli jam. 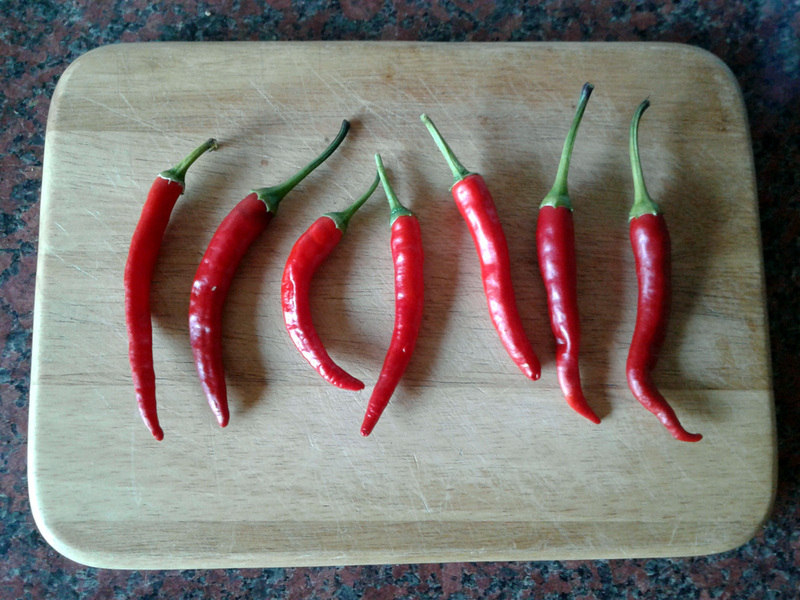 Most of them went into a few jars of chilli jam. One of the jars – the last to be filled from the jam pan – had re-crystalised and I was going to ditch it, until my Mum suggested it might make a good chilli glaze for pork chops. Good call, Mum. Fruit-wise, we’re all about the Autumn rapsberries at the moment, although everything else has finished for the year. We’ve been stewing most of them up with apple and some of our frozen blackcurrants, for use as a breakfast porridge topping or custard-drenched pudding. Delicious either way. 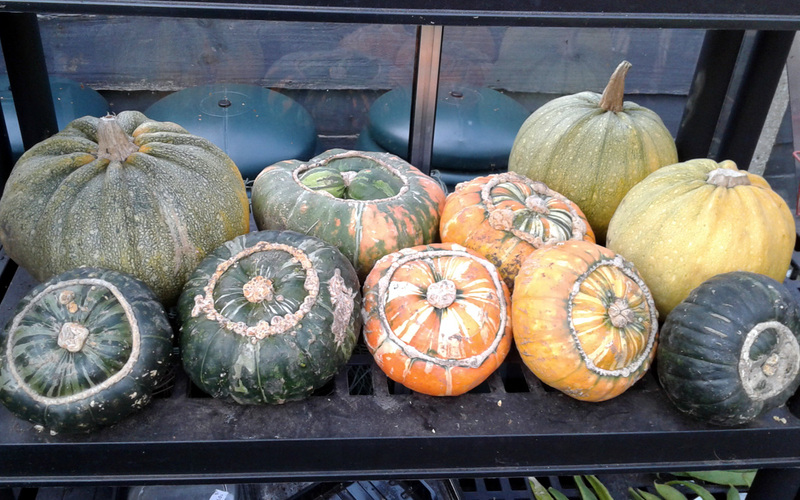 The weird and quite wonderful, knobbly-looking specimens are Cucurbita maxima ‘Turk’s turban’ and as you can see we ended up with seven good-sized fruits from our three-sisters patch. There were a few more that almost made it before the rot or the mice got them, but we’re happy with our seven; that’ll be plenty to keep us going a while(if I don’t get over-generous and start giving them away). I reckon they look like baking-squash to me, that rind will be a beggar to peel otherwise. 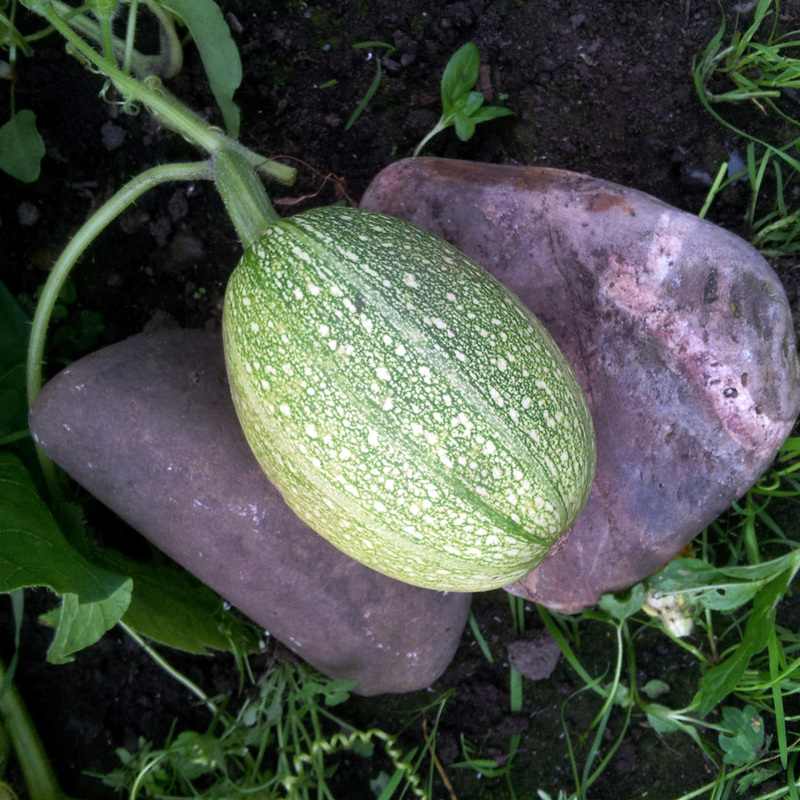 The three large, almost-round squash are mature Cucurbita pepo ‘Tondo di Piacenza’ (a.k.a. courgettes). 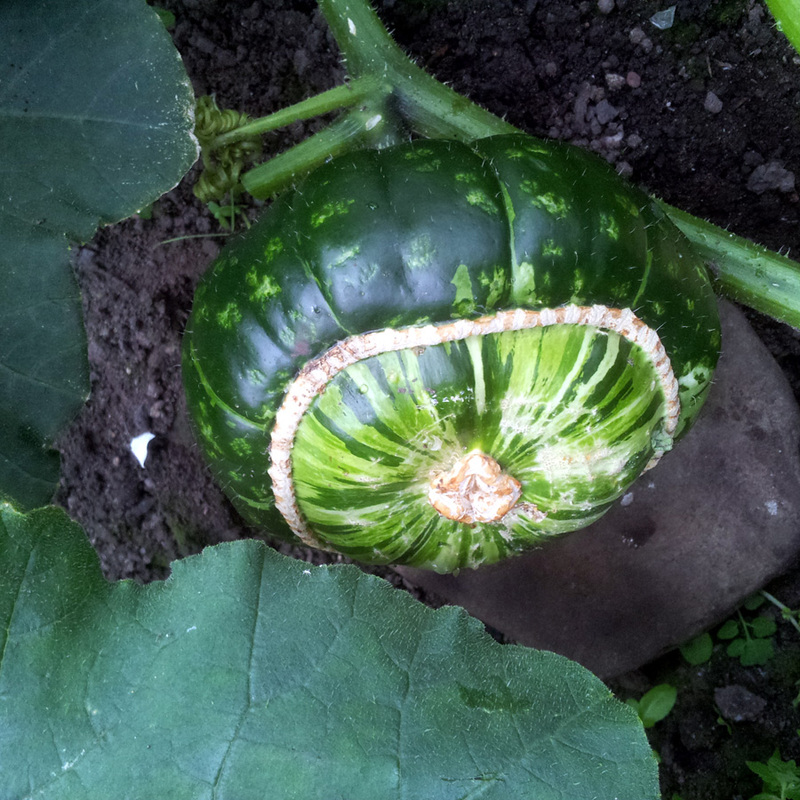 An accidental discovery last year, when one last courgette matured into what a Twitter-correspondent from South Africa identified as a gem squash. 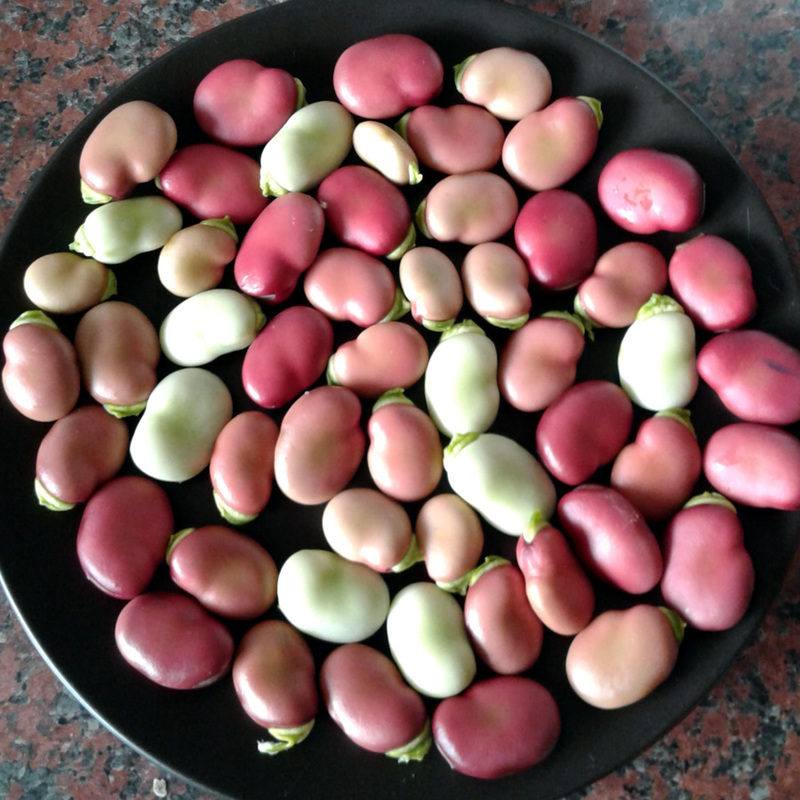 So this year, I deliberately left one fruit on each Tondo plant to do its thing, and this is the result. If they’re as tasty as last year we’re in for a treat, especially once they’re steamed and then mashed with mountains of butter and black pepper. Yum. I spent a happy couple of hours this weekend lifting the last of our second early potatoes down on Plot #59 . 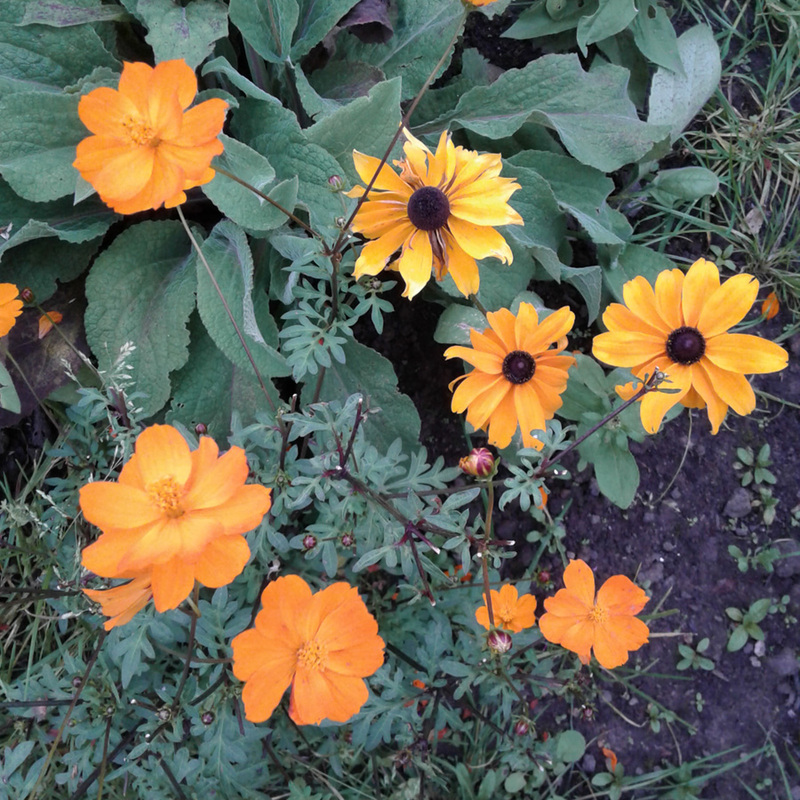 They’re a variety called ‘Saxon’, which is fast becoming a firm favourite. They have a lovely, creamy texture when boiled or steamed as new potatoes, store really well and make great mash, roasties and even jackets, if they get large enough. A true all-rounder. 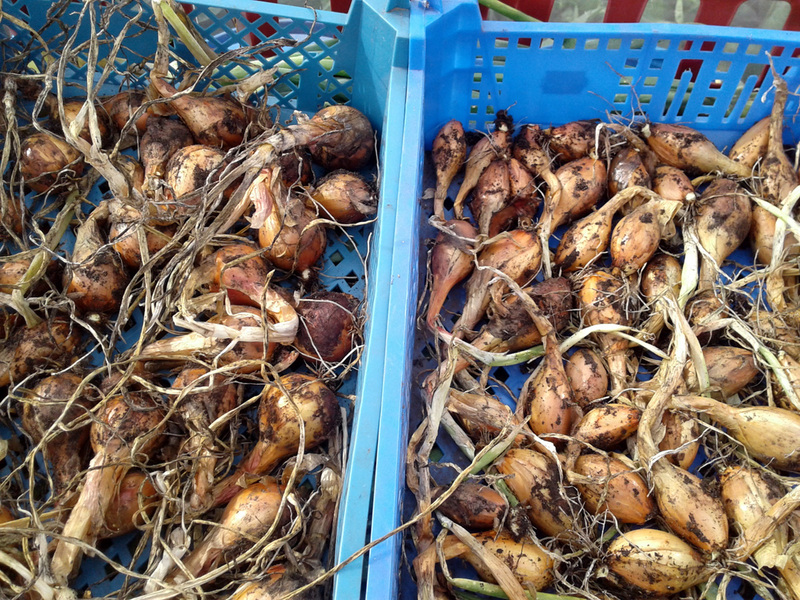 This year’s crop was hit by the potato blight that has swept through our site this damp and dreary summer, and I took the haulms off at the beginning of July. 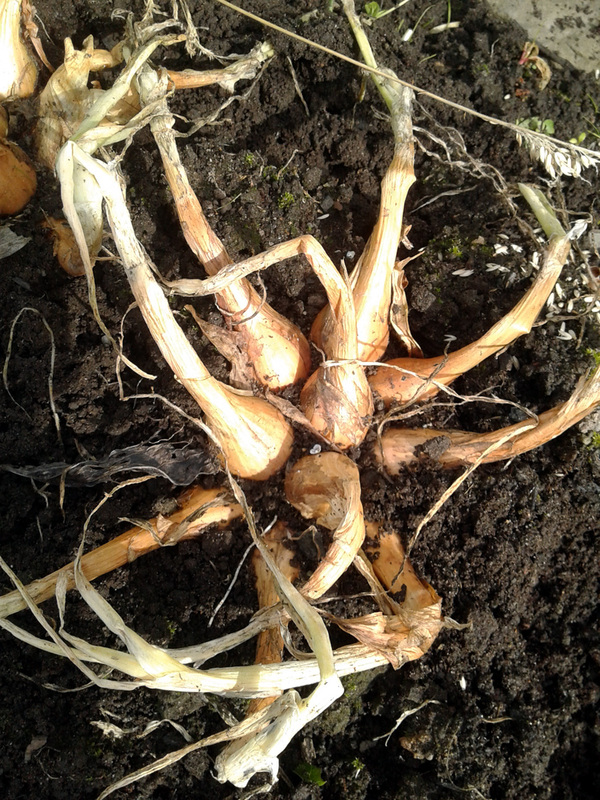 Luckily a decent number of tubers had been able to form before I took drastic measures, and although we’re well down on last year’s epic crop, we should have enough to last us through to the end of the year at least. 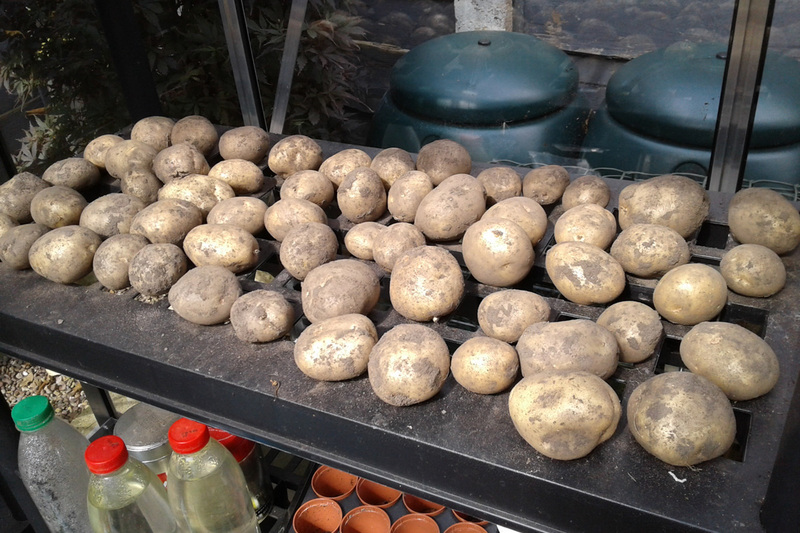 They’re currently drying in the greenhouse before cleaning up a bit and sorting for either immediate use or storage, depending on the degree of slug damage. …and another shelf full of Saxons. 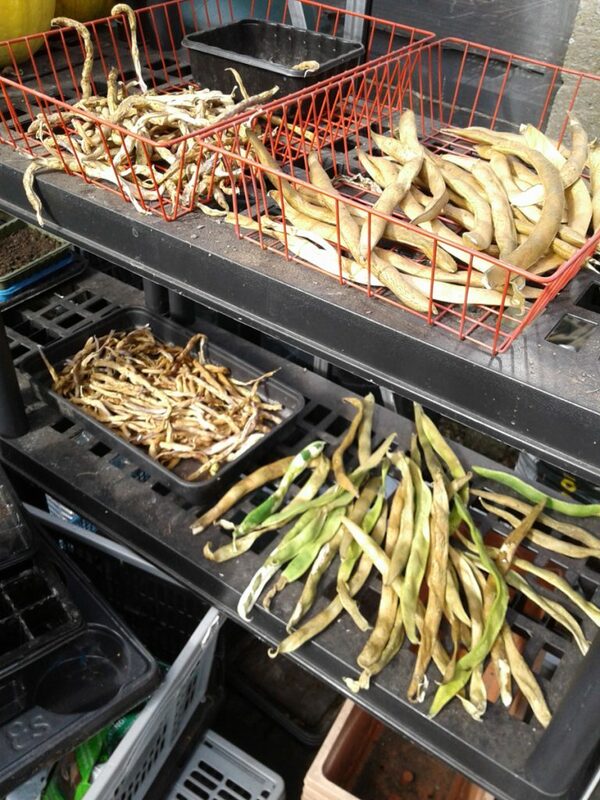 Jo and I also picked several kilos worth of assorted beans – runner, French and broad – which I spent my Sunday evening trimming, chopping, blanching and freezing for our winter stores. 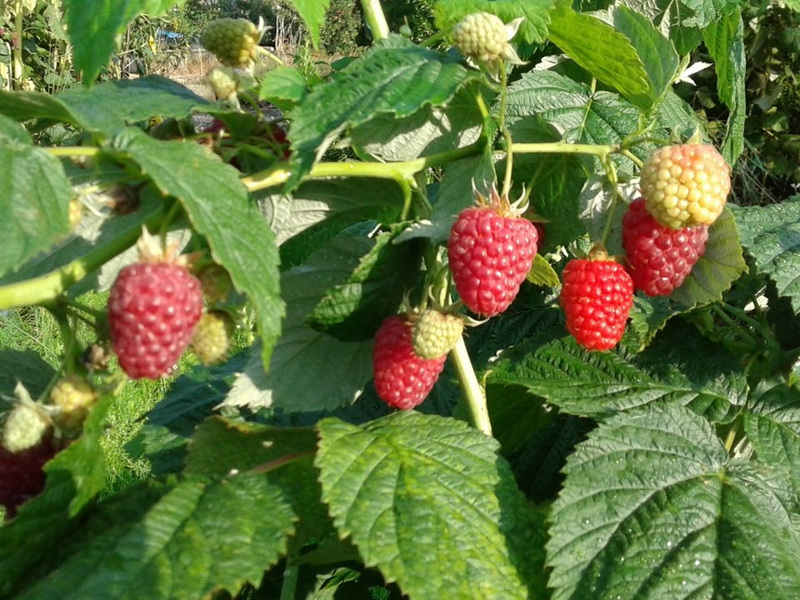 We picked another few tubs of mixed berries, too: raspberries, redcurrants, blackcurrants and Japanese wineberries (see last week’s post for pics). And we’ve picked the last of the peas, most of which are too dry for eating fresh, but we’ll try storing them for soaking and adding to winter stews, see what happens. Oh, and more courgettes (which rather goes without saying) and a bit more purple calabrese. 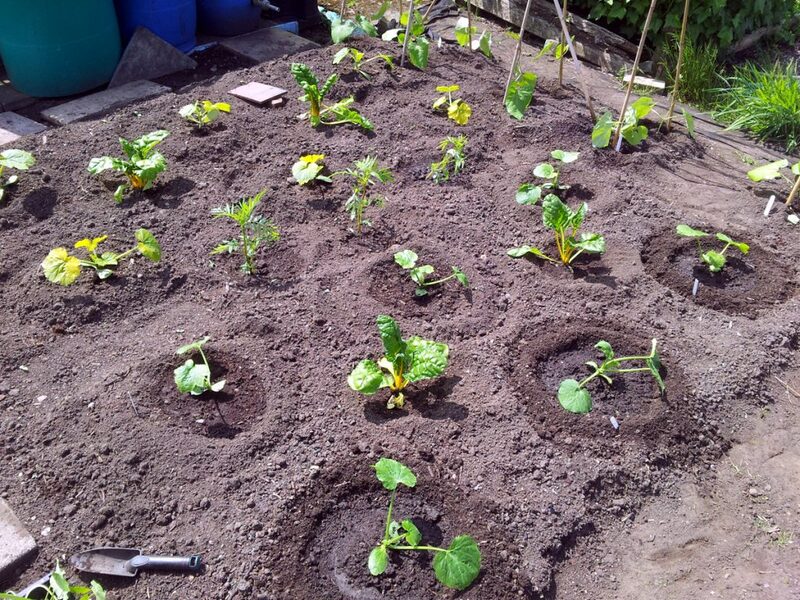 Still to come: sweetcorn (forming up nicely, let’s hope they get enough warmth to ripen), winter squashes, chillis, cabbages (not long gone in, let’s hope they establish before winter), kale (likewise) and hopefully more turnips. Hardly any carrots though. The carrot-fly have ripped through them and destroyed around 95% of the crop. More on that set-back in another post. Welcome to Your New Plot. The Hard Work Starts… Now. 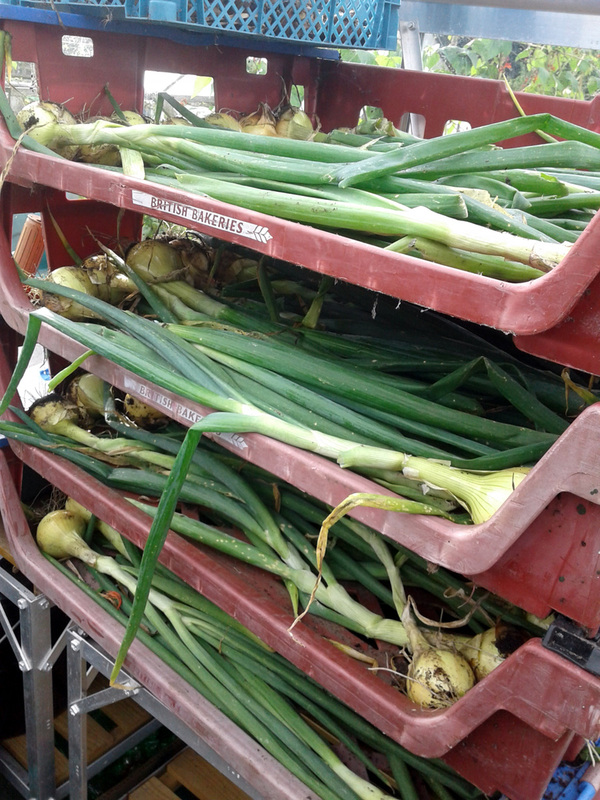 How d’you like them onions? What’s that? 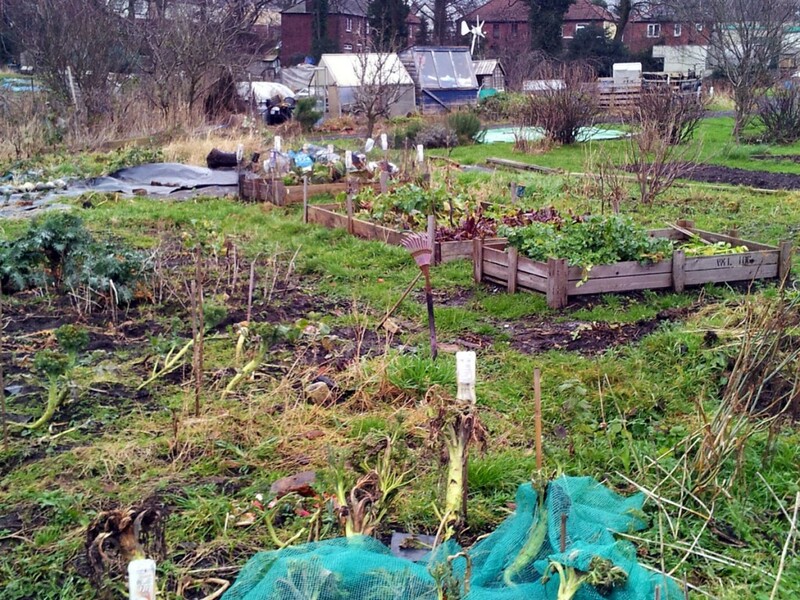 You’ve just taken on an allotment for the very first time? Hey, congratulations! You’re about to start on something that could be truly wonderful; great for your health (physical and mental alike), your diet, your shopping bill, your social life, you name it. Just wait until you lift your first potatoes, or start picking your first raspberries, or see your first sunflowers unfurl, or… well, the possibilities are endless. 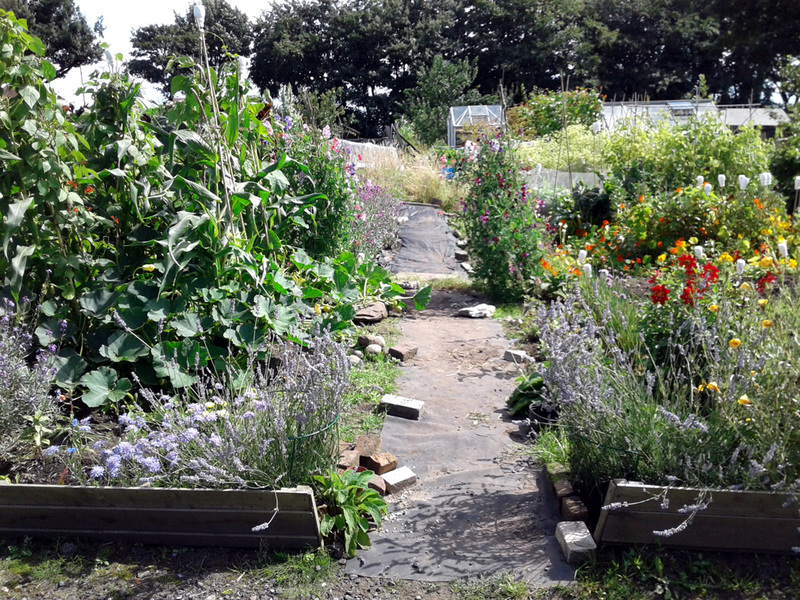 Jo and I started out on Plot #59 down at Langley Allotments back in January 2014. Here are a few things we’re either very glad someone mentioned, or wish someone had sat us down and properly told us, before we launched ourselves at the plot and got stuck in. Yes, a quick strim and a once-over with a rotavator might seem like a great way to quickly make your new plot look lived in (and of course you get to play with power tools, which is always fun). But once you realise that you’ve just chopped up a huge patch of calystegia sepium (better known as bindweed) – which re-grows into a whole new plant from even the tiniest fragment of root – and liberally distributed it across a large section of your allotment, you really will wish you’d taken a bit more time and been a bit more thorough with your hand-weeding. Luckily, Jo’s folks warned us about this sort of thing before we started, so we’ve made it our practice to weed and clear thoroughly and diligently from the beginning. A few other plot-holders on our site don’t seem to have been given the same advice though, and they’ve tended to be the ones who haven’t lasted the distance. Likewise, Glyphosate-based weedkiller might seem like a handy solution to a problem patch, but, well, it’s been banned in several countries for being probably carcinogenic, and although its license has been temporarily extended by the EU, the debate is raging across the rest of the World. Your health, your risk, your decision, of course. Personally though, I’ll only ever use the stuff on path areas that I know won’t be used to grow any food crops, ever. And then only on a still, dry day, to avoid the stuff blowing into areas I might actually want to grow on. So what to do about those tricky, problem areas..? 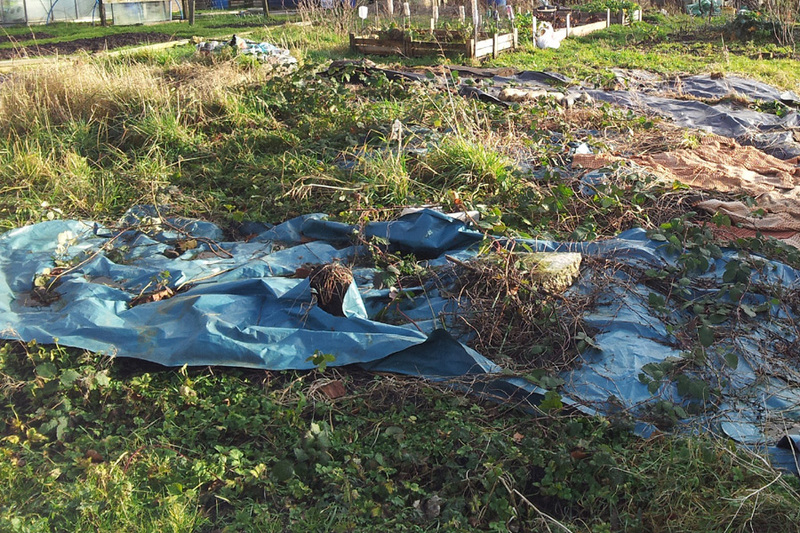 On a year-one (or -two, or -three) allotment, your very best friend might just turn out to be a large, dark-coloured tarpaulin or a long, wide roll of heavy-duty weed membrane. Beg, borrow and, er, acquire as many as you can, and then cover over as much of the plot as you’re able to. 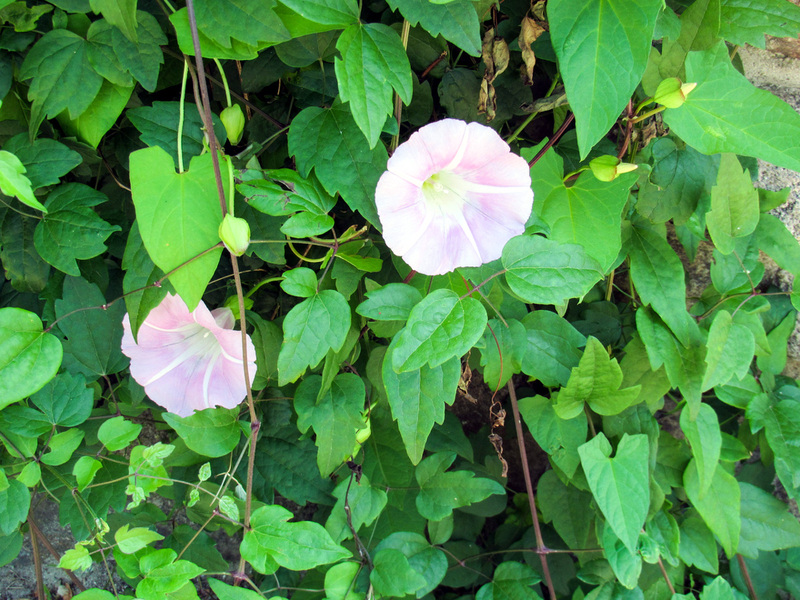 All plants – including weeds – need light to thrive. Block the light and you prevent photosynthesis. No photosynthesis means not enough energy for the plant to grow, whilst respiration continues to consume its internally-stored resources. Net result: dead plant. Black is best, blue and green let a bit too much light through to be totally effective, white and/or clear are next-to useless, but putting down a layer of cardboard under a lighter-coloured tarp is a good combination; the cardboard blocks the light and a well-weighted tarp on top prevents the cardboard ripping up and blowing around in the wind. Leave those covers down until you’re ready to tackle a section – a year or more, if you can – and when you lift them, you’ll find the job of clearing whatever might have survived is much, much easier. Two-and-a-half years on, our patch is looking a whole lot better than when we started. We still have a section in the middle that needs properly clearing, plus the central and border paths to sort out, and some sort of seating area to set up at the back, and… well, it’s still very much a work-in-progress is what I’m saying. But we’re getting there. 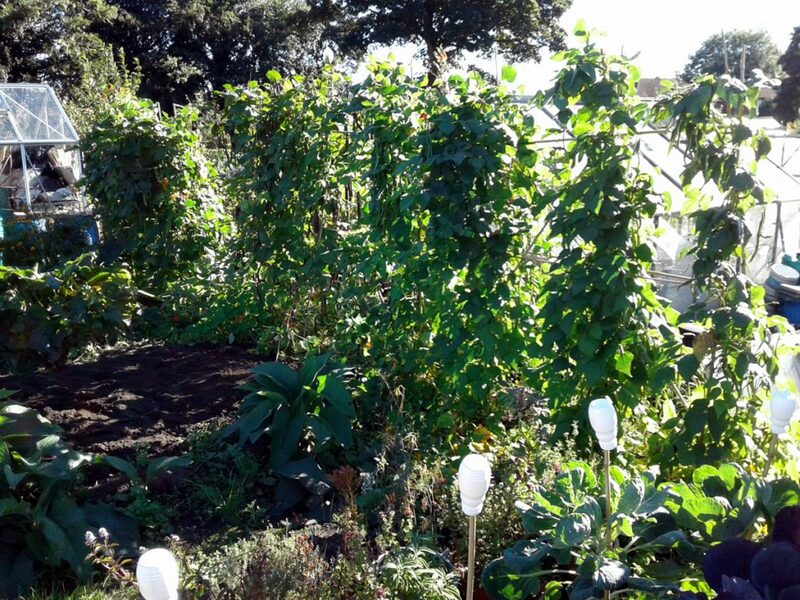 We were lucky in that our allotment secretary told us to think of it as a three year project just to get the basics sorted out. Which took a lot of the pressure off, so we’re grateful for that. I don’t just mean that in a ‘have a chat, make friends, share a flask of tea, swap surplus produce’ kinda way, although all of that is important (and great fun) too. I’m talking about the responsibility that you have to your neighbouring plot-holders not to let your patch get out of hand. 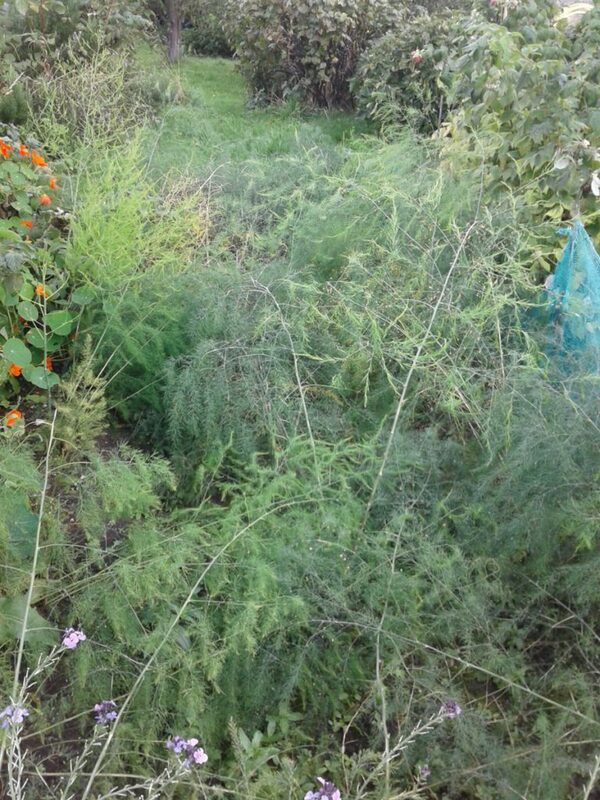 In my previous advice to would-be allotmenteers post, I mentioned that weeds have no respect for boundaries and borders. None whatsoever. If you ignore those persistent dandelions, or that rapidly-spreading clump of creeping buttercup, or the gnarly mess of bindweed clambering up your apple tree, or the forests of dock leaves that are sheltering a thriving population of slugs, then before too long the stuff will be making a bid for freedom and heading for pastures new and plots next-door. And that’s not going to make you a popular plot-holder. You’ll be given a bit of leeway to start with, especially if you’ve bravely taken on a plot that’s been an absolute nightmare for a while (as we did). But if all you do is turn up at the beginning, dig a bit, weed a bit, promise yourself you’ll be along again shortly, then disappear off for a nice long holiday abroad during weed-growing season (which is any time from March through to October) then you might come back to a few less-than-friendly mutterings about your spreading weed problem, or maybe even a pointed chat with the allotment Secretary about the need to improve standards or move on. Keep things under control with the aforementioned covers. Dig, clear and plant when you need the space and then make an effort to keep that planted space as weed-free (or at least, as low-weed) as you can, and everyone will get on just fine. When you first start growing your own, there’s an awfully strong temptation to assume that more means… well, more. Cramming an extra fruit bush into a gap, or planting up eight kale seedlings in the row instead of six or generally ignoring the spacing instructions on the seed packet and assuming that it’ll probably be okay. Fooling yourself you are, Padawan. Those spacing guides are there for a reason: namely that the experienced plantspeople who come up with them know how big those plants will get in time. Plants need enough space to ensure an adequate supply of light (see photosynthesis note, above), water, nutrients and root-room if they’re to grow and expand to their full, adult, food-producing potential. 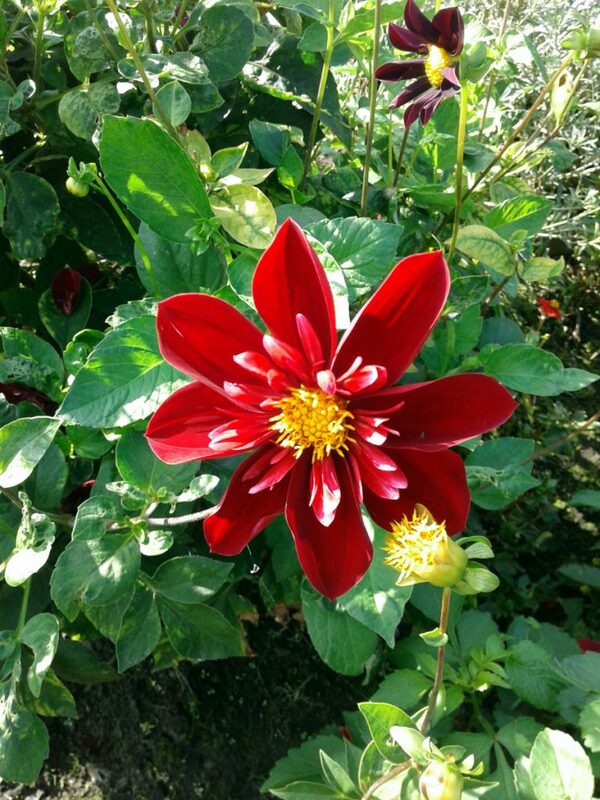 Healthy plants are also better able to fight off the almost inevitable pests and diseases that will afflict and attack them during the course of the growing season. Deny them the essentials and there’s a good chance that the plants will suffer, maybe even die, and overall yields will be reduced. Also: you need to remember to leave room for you. Jo is constantly telling me off – and quite rightly – for forgetting to leave adequate walking and working space between rows of crops. 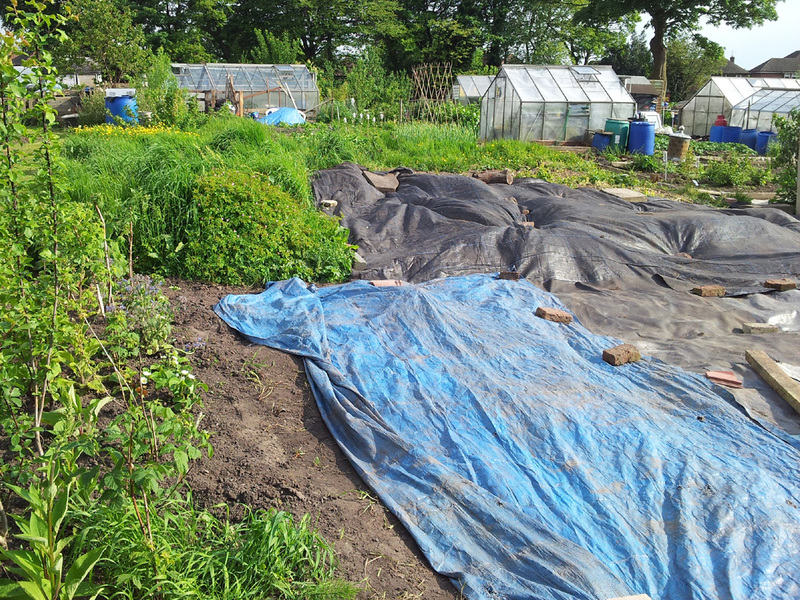 How is she supposed to get in to weed the brassica patch – she quite reasonably wants to know – if there are so many brassicas in the patch that there’s nowhere left to step, stand, crouch, or perform any of the other necessary weeding manoeuvres? Good point, well made. One job we’ll need to do this winter is re-spacing the fruit bush section. 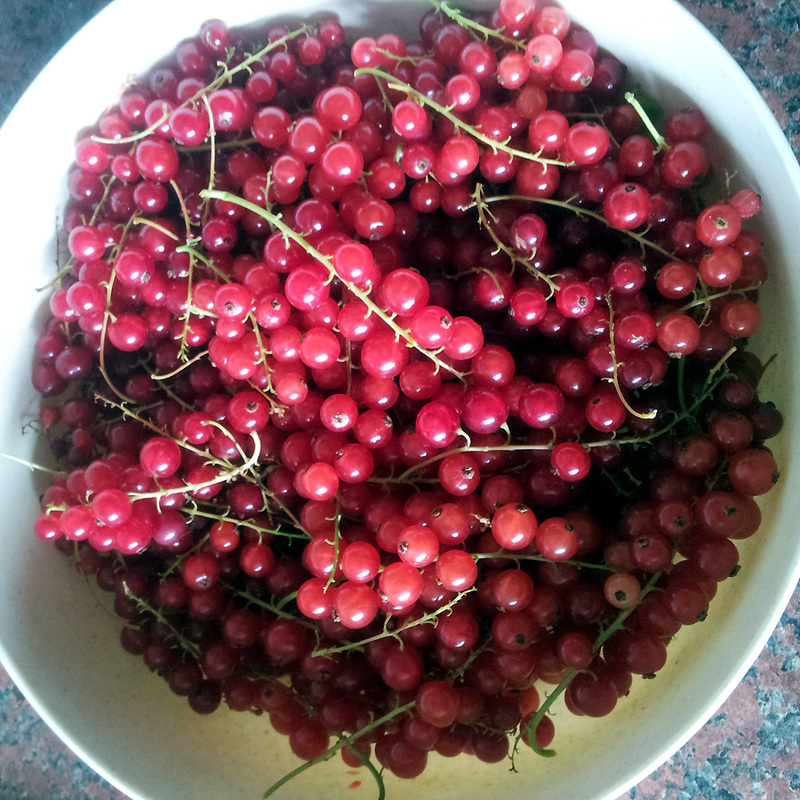 When I planted out a few blackcurrants, gooseberries, redcurrants etc. a couple of years back, I didn’t take eventual sizes into account. 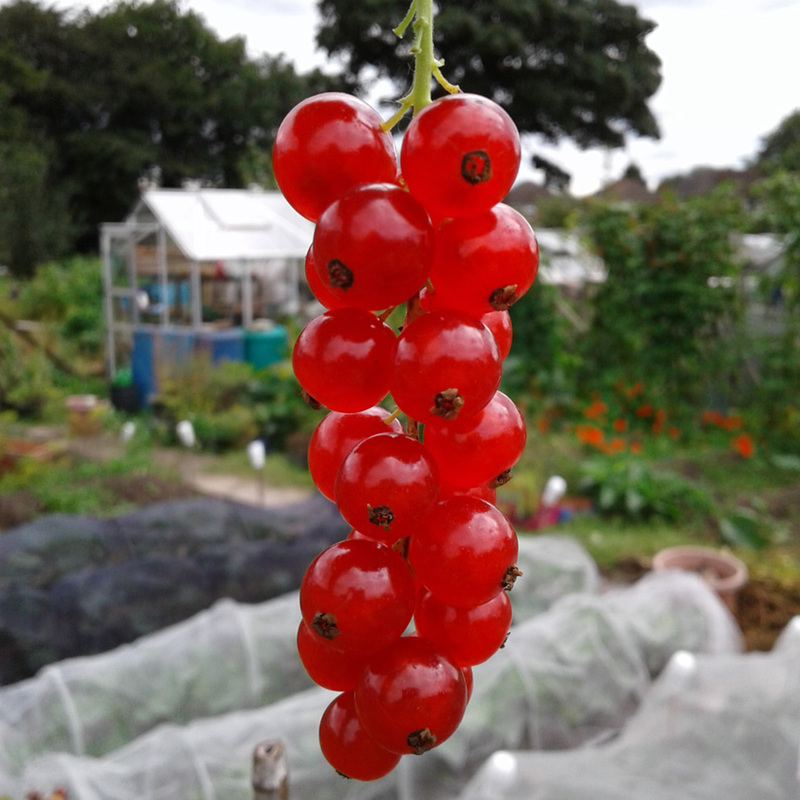 We now have a patch of highly vigorous gooseberries right in the middle of our blackcurrants and redcurrants, making it extremely difficult to harvest either of the latter without risking severe puncture wounds from the spines of the former. Note to self: when Carol Klein says, in her Grow Your Own Fruit book, “space blackcurrant bushes six feet apart”, she doesn’t mean “ah, go on, three feet will probably do”. There are exceptions, of course. A lot of the spacing recommendations have been handed down from Victorian kitchen gardens, when maximum yield was the absolute goal. James Wong, in his book Grow For Flavour points out that not all the Victorian guidelines will produce food crops with the best flavour and that sometimes, treating them mean badly make them produce better-tasting results. 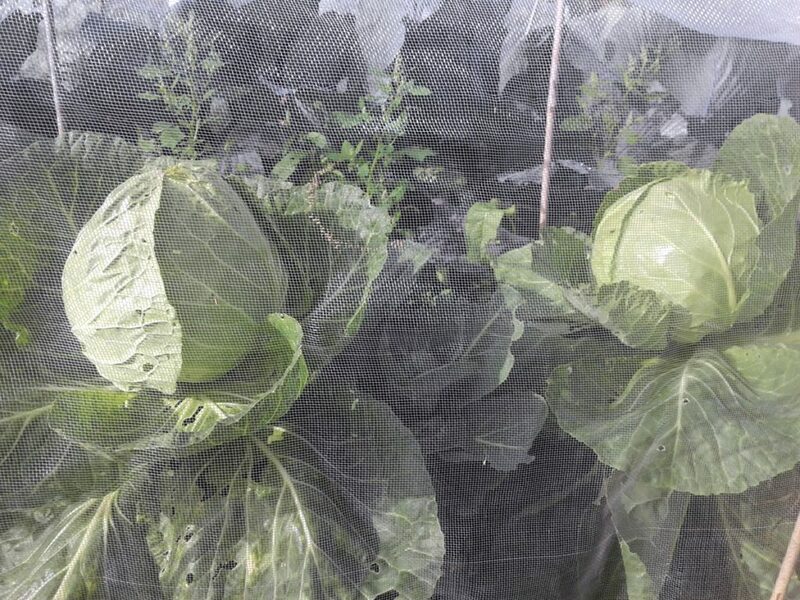 And in last year’s series of Beechgrove Garden, Jim demonstrated that cabbages will grow to fill the space you assign to them, so if you want smaller, two-person plants rather than leafy beach-balls, then planting them closer is the way to go. So, yes, your mileage may vary. 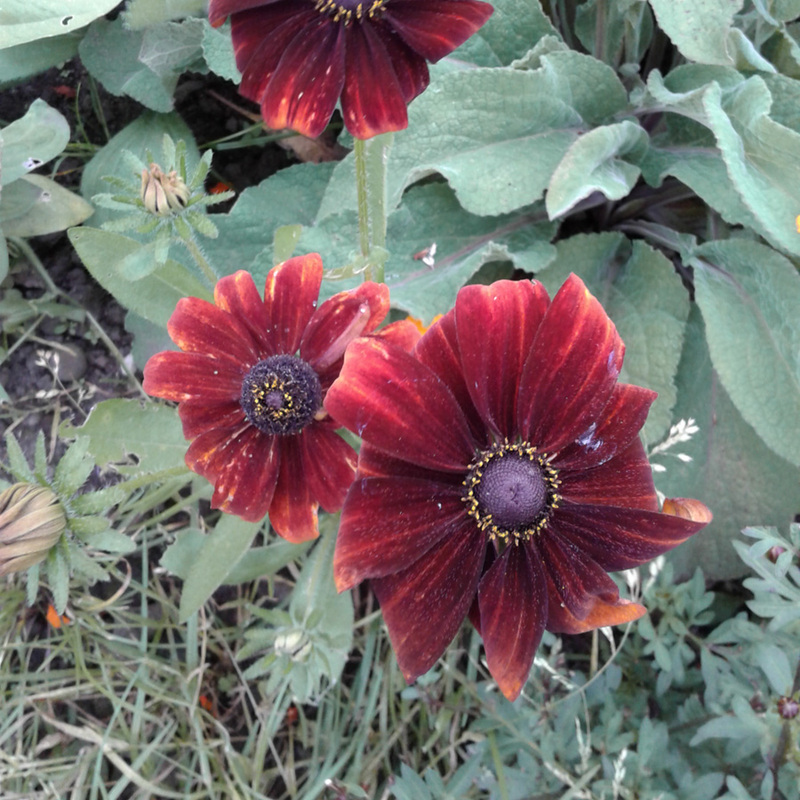 But generally speaking, my advice would be to go by what they tell you on the seed packet, plant larger specimens with enough room around them to prune, harvest, water and weed under them, and bear in mind that anything else you do is an experiment and that results may not be guaranteed. Because once you’ve put the hours in, covered over, dug and cleared the weeds, planted out your seedlings, done your very best to guard them from pests and diseases, nurtured them through droughts, floods, tornadoes and hailstorms (if the average British summer is anything to go by)… you’ll finally get to the really, really good part: harvesting the fruits of your labours. If your fingers are even vaguely green, or you have any sap in your blood whatsoever, then the feeling of picking, cooking and eating your own is a truly great one. Whether you get your buzz from doing your bit to eliminate food miles, putting good food on your family’s plates, a renewed connection to the Earth, or just a tiny bit of (understandably slightly smug) self-satisfaction at a job well done, then it’s a really great feeling to have. You can and should be justifiably proud of yourself, because whichever way you look at it, you will have achieved something good, wholesome and genuinely beneficial to you and those around you. Appreciate it for as long as it lasts – pretty much all year, if you get your crop planning right. Then, once the harvest has slowed to a winter-trickle, sit yourself down with a pad of paper and a pencil, and start planning for next year’s growing season. As you steadily move from novice to experienced allotmenteer, you’ll find that there’s always more work to do, more mini-projects to dream up, more lists of new must-grow crops to jot down, and so much more to learn. It all starts again in the Spring and, with your first season under your belt, you’ll be desperate to get on with the next one. Don’t forget to make good use of the off-season as well. Work out what jobs you can usefully do – remember: you shouldn’t dig when the soil is wet, because you’ll destroy the structure and limit its potential – and set yourself up with an action list. 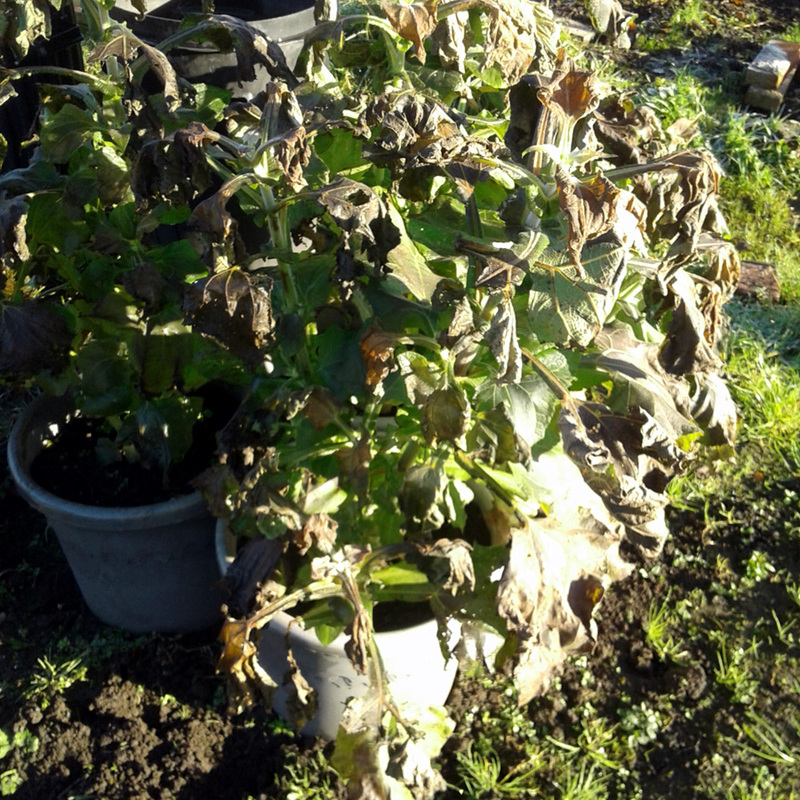 There are tools and pots to clean, equipment inventories to check, maybe a greenhouse to scrub in February or early March. Plenty to keep you occupied. You can develop your allotmenteering skills and knowledge during the winter break, too, by reading and researching. There’s a huge amount of information out there, in books and magazines, on websites and blogs, to be had by picking the brains of the old boys from your allotment site over a pint or a cuppa, and if you avail yourself of that you’ll be in a much better position long-term. Go for it! And enjoy! 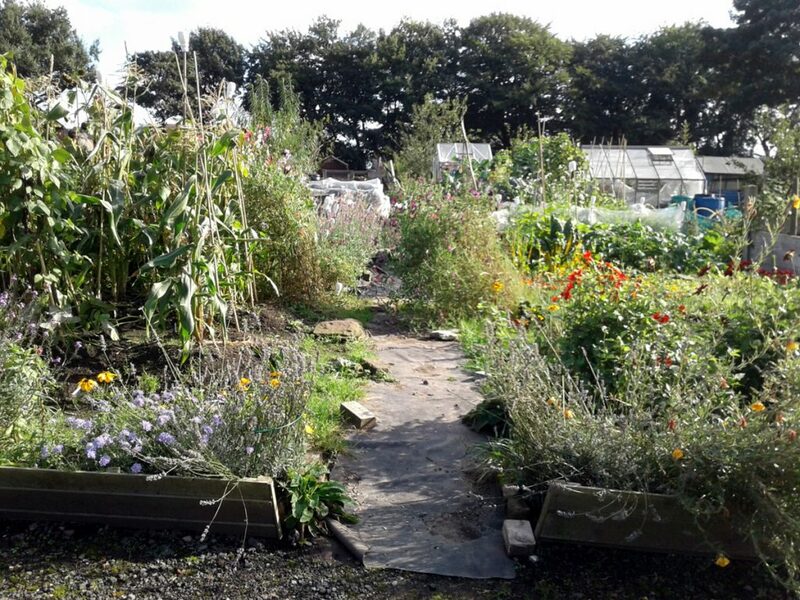 It’s National Allotments Week this week, and the National Allotments Society website is a great place to go for all sorts of allotment-related info. Masses of lush green foliage and summer colour this month. 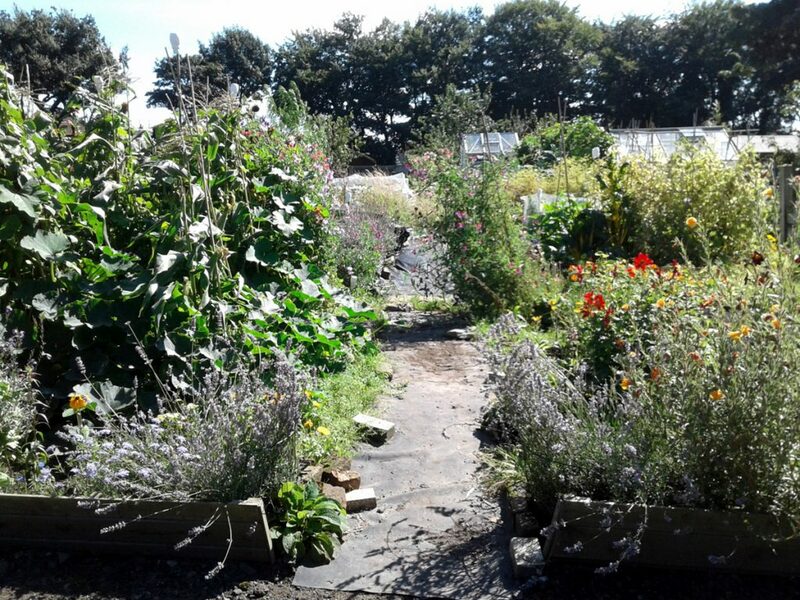 July was a hugely busy month on our allotment plot, with regular picking and harvesting added to the usual rounds of planting out, cutting back, dead-heading and weeding. The weather wasn’t too bad on the whole – mostly overcast with sunny spells, a few hot, dry days and some rain here and there – so we were able to get on with a fair bit of work. We were away for a few days though – which of course gave the weeds a head-start – so we’ve not had much time to clear and prepare the last few sections of rough ground as we would have liked. 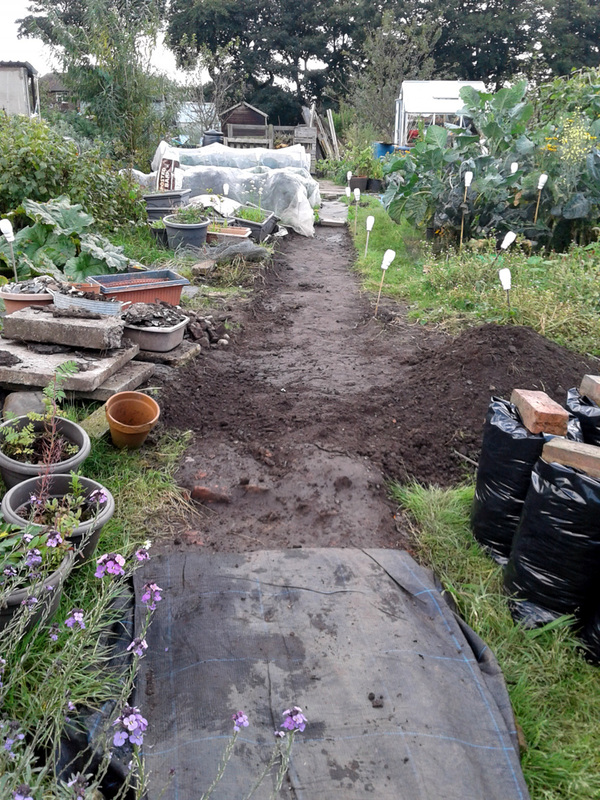 That might be a job for the Autumn, along with laying the long-awaited flag path up the centre of the plot, but we’ll see how the rest of the summer goes. August isn’t too promising so far. 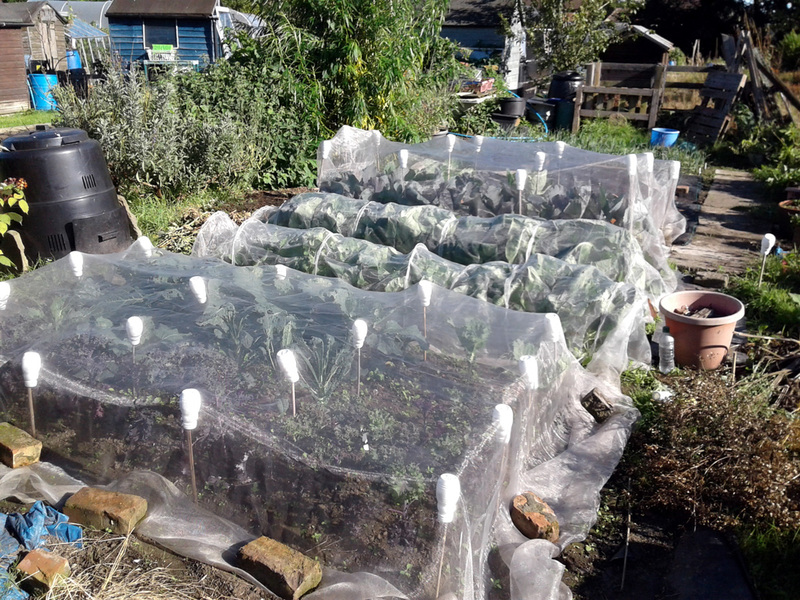 Netting any brassicas is essential to keep the ravenous pigeons at bay. I was able to dig over one new section to plant out cabbages. 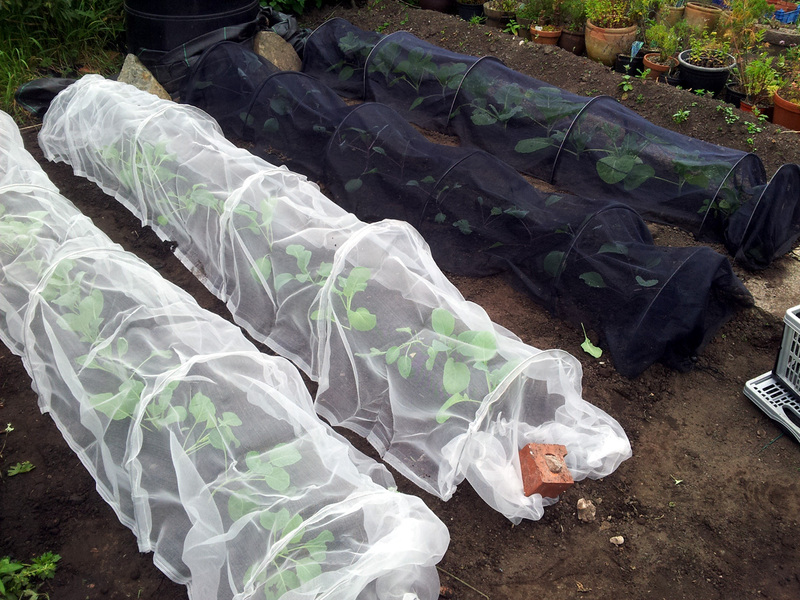 They’re netted against pigeons and (hopefully) cabbage white and seem to be doing okay last I checked. Still young but developing nicely. I love the two-tone effect on these squashes. I actually have no idea how big either of those needs to be before they’re ready to be picked, or how long they need to ripen and cure before they can be stored. More research needed, clearly. Our fruit section is also doing very well. Although the strawberries have finished and are sending out runners, and the last few gooseberries have gone over, the Autumn raspberries are just getting into their stride, we have bushes full of blackcurrants that need picking, and we had enough ripe redcurrants to make jelly. 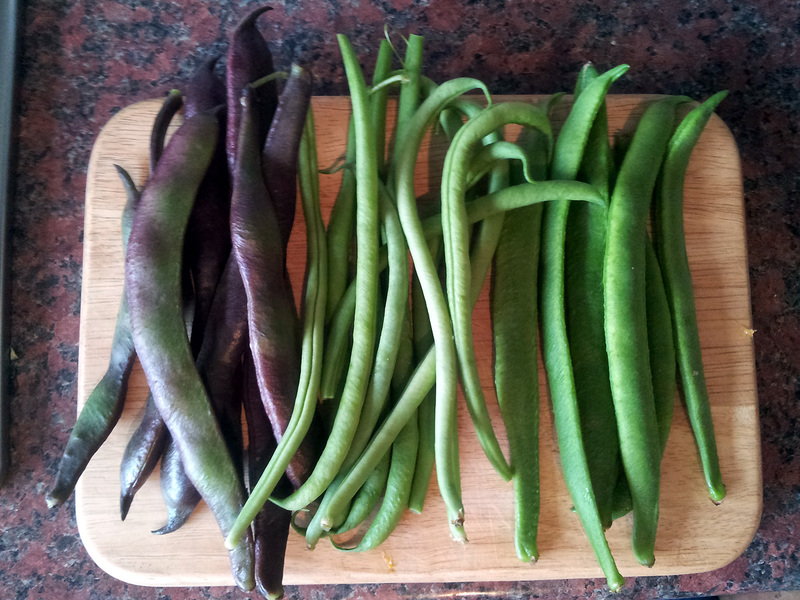 The first (of very many) beans have been picked. So much good stuff! (Deep breath…) potatoes, courgettes (so many courgettes), carrots, peas, beans (runners, broad and French), onions, garlic, elephant garlic, gooseberries, raspberries, Japanese wineberries (just one or two so far, more to come), redcurrants, a small squash, a small head of purple cauliflower (that actually turned out to be calabrese), and handfuls of sweet peas. A big bowl of juicy fruit destined for the jelly pan. We’ve been busy in the kitchen as well, making batches mixed fruit jam (raspberry, blackcurrant, strawberry and gooseberry) and chutney (courgette and tomato, then courgette, runner bean and tomato). And we’ve discovered three bean and courgette ratatouille, which is a great way to cook up a surplus. 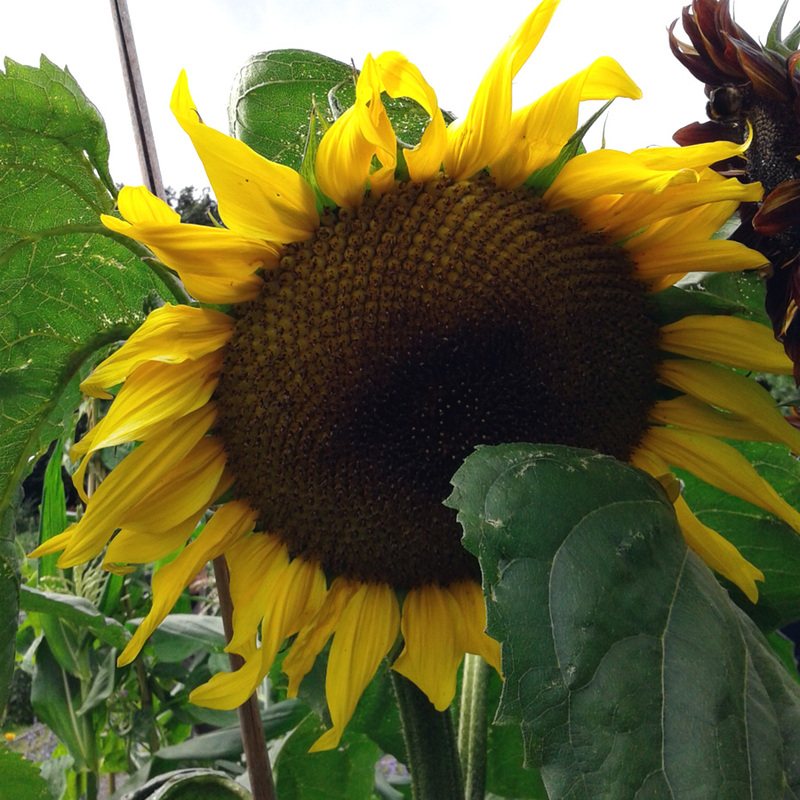 Jo’s sunflowers are looking particularly good this year, despite the general lack of sunshine. 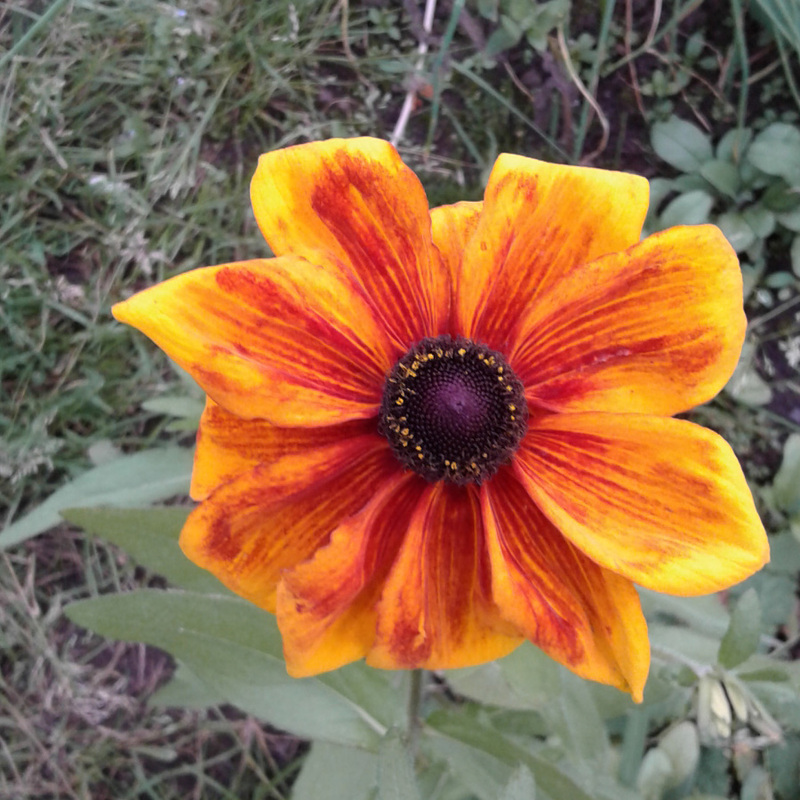 We’ve also got rampant nasturtiums running through the beans (and across the side path, into the neighbour’s manure bay), towers of sweet peas, mounds of dahlias and plenty more besides. All of which thoroughly deserve their own post, which I’ll get around to before too long. That’s it for last month’s update. 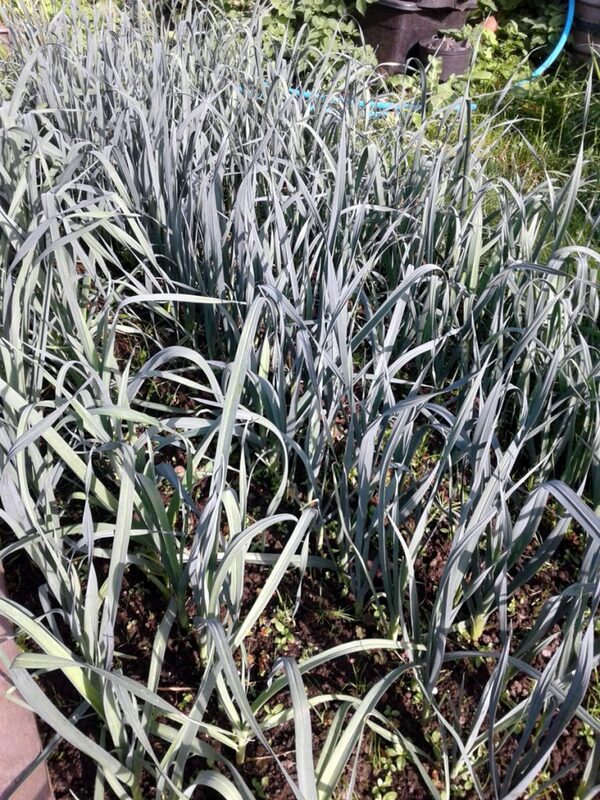 Hopefully this month we’ll get on top of the summer weeding and make a start on sowing some more winter veg, oh, and get the leeks into the ground. They’re definitely ready for planting out.